Pom Berry-Licious Smoothie | Yummytums! Posted at 12:06 pm by Yummytums! Are you turned off by the idea of putting greens in your smoothies? Well, here’s one packed with healthy ingredients, minus the green stuff. I call it Pom Berry-Licious. It’s sweet and fruity and there’s nothing not to like about it! The most important ingredient in this smoothie is obviously the pomegranate juice. So buy the real stuff; the ingredient list on the bottle should indicate 100 percent juice with no added sugar. I love the Pom Wonderful brand because it meets this criteria. You can often find the small bottles on sale for less than $1 each. When I see a sale, I buy several at a time; they’ll keep in the refrigerator for weeks and a little bit goes a long way. Pomegranates are good for you; they have a wide variety of health benefits including a potent anti-oxidant profile. Research has shown that they can lower blood pressure and inhibit abnormal platelet formation that can lead to heart attacks or strokes. 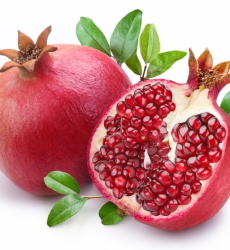 Some research even suggests that pomegranates can help protect against osteoporosis. 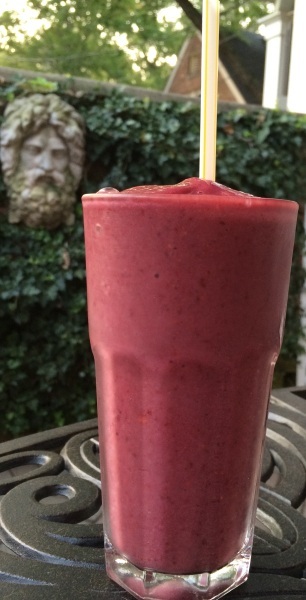 In this smoothie, I combine the juice with potassium-rich bananas, a frozen berry medley mix and almond milk. The result is sweet and fresh-tasting. 1/2 cup pomegranate juice — buy the real stuff! Pour the juice and almond milk into a high-speed blender. Add the frozen ingredients and blend until you reach the consistency you desire. Enjoy! I'm a full-time professional who loves to cook and tries to lead a healthy lifestyle. I stick with whole foods and go organic whenever I can. When I find a great recipe, I enjoy sharing it.